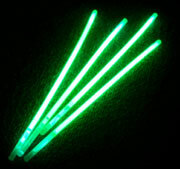 Sticks used to stir your drinks that glow in the dark. Choose from blue, green, pink, or red. Packs of 50. $26.11 per pack for 6 packs or more. $23.24 per pack for 12 packs or more. $22.71 per pack for 24 packs or more.